In 2009, Phil Viney from Design Stage embarked on a mission to design the perfect sound system for the new Brisbane District & Supreme Courts building. Along the way, Phil was met with a series of challenges, largely due to the hostile acoustic environment. Each court room had only hard reflective surfaces and Phil was directed to discreetly hide every speaker, a seemingly impossible task. The courts were all designed with polished concrete ceilings, raised timber floors (for service access) and a combination of glass and plywood paneling in between. Under strict instruction from the Architect, no speakers were to be mounted to any surfaces. This prompted Phil to base his audio design on a distributed close monitor system. Further design constraints included physical size limitations, concealed mounting techniques and speaker locations were dictated by interior joinery. Phil approached Acoustic Technologies about two years ago to develop a range of bespoke speaker products that would tick all the boxes. With their expertise in delivering custom solutions Acoustic Technologies was the obvious answer. The final product range consists of five bespoke speaker systems, two customised version of existing ALA series speakers and seven ALA07C-T beam steered array speaker systems complete with FLA8 DSP/Amplifiers for the Banco Court. All of the five bespoke models had a different set of design criteria to fit into the environment, but all are based on the same 3″ planar driver to ensure common tonality across the range. The planar driver offers full range performance. Without the need for a tweeter and crossover network the speaker enclosures could be kept smaller to meet size restrictions without compromising fidelity. Another benefit is improved phase response because there is only one point source. This is not normally critical, but with listeners only 50cm away from the speakers it is an important consideration. 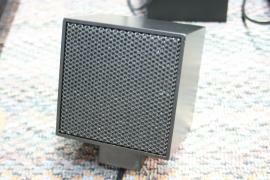 Finally, the speakers locations were dictated by the joinery design and were generally not ideal. The wide dispersion pattern of the planar driver allows full range performance even with the listener well off axis. 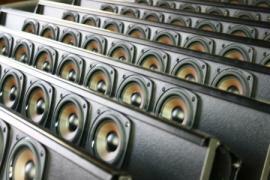 A total of 152 ALA04 and ALA08 speakers were required at custom lengths to match flat panel displays. Fast forward to 2012 and AT is rolling over 1400 speakers off the production line in time for completion of this mammoth size project. The entire AV installation contract was awarded to Brisbane based Audio Visual giant, VideoPro. Their experience and resources put them in the perfect position to successfully deliver the project.